This valance is the perfect companion for the Rory quilt. I appreciate that it is one piece and not a patchwork to resemble the quilt. Just like the quilt, the workmanship is perfect. Want further proof? There was not one single dangling thread to be clipped. No stray threads to be picked off. The lining is another asset and adds to the nice hang of the valance. One can opt to run the rod through the full pocket or to use the evenly spaced tabs. I tried both ways, and I think with a secondary valance the tabs would have been useful to make that full ruffly look that I did not want. 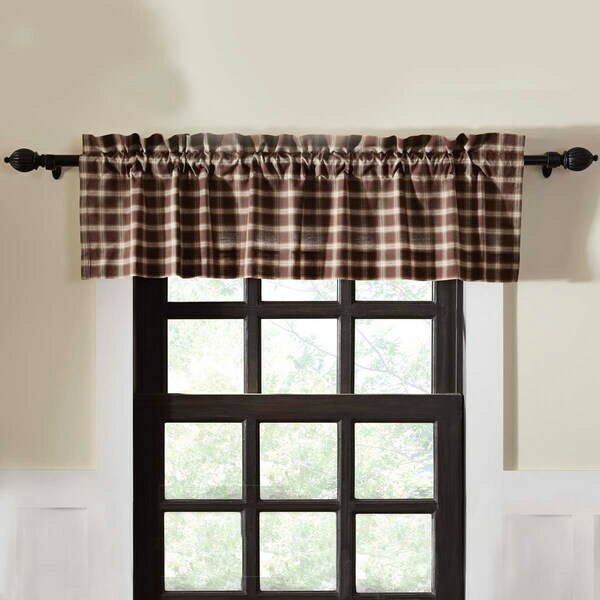 Rory Lined Prairie Curtain Set - 63" x 36"
Rory Lined Panel Set - 84" x 40"
We're mad-for-plaid in the Rory Valance. Chocolate, creme, and almond windowpane plaid dominates in this all cotton set. I love the plaid. The colors are muted which I like. It's a plus that they are lined which gives the curtain some depth. They fall nicely from the window. I highly recommend these if you are looking for a brown plaid. Absolutely wonderful price too.